FUEL EFFICIENT 29 MPG Hwy/20 MPG City! CARFAX 1-Owner. Heated Leather Seats, Onboard Communications System, iPod/MP3 Input, Dual Zone A/C, Remote Engine Start, All Wheel Drive, Aluminum Wheels, Back-Up Camera, Satellite Radio, Premium Sound System, Non-Smoker vehicle SEE MORE! Leather Seats, All Wheel Drive, Heated Driver Seat, Back-Up Camera, Premium Sound System, Satellite Radio, iPod/MP3 Input, Onboard Communications System, Aluminum Wheels, Remote Engine Start, Dual Zone A/C, Smart Device Integration, Brake Actuated Limited Slip Differential, Heated Seats, Heated Leather Seats Rear Spoiler, MP3 Player, Keyless Entry, Child Safety Locks, Steering Wheel Controls. Ford Titanium with Oxford White exterior and Medium Soft Ceramic interior features a 4 Cylinder Engine with 231 HP at 5500 RPM*. Non-Smoker vehicle. 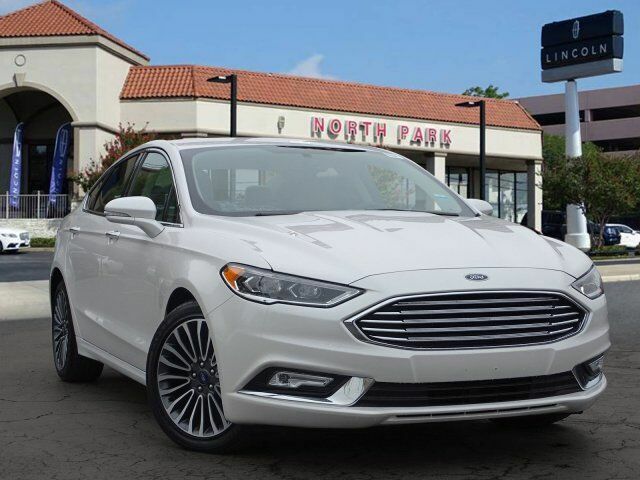 Edmunds.com`s review says The brakes on the Fusion inspire confidence, they`re easy to modulate in traffic, and performance at the track was very consistent. In a simulated-panic stop from 60 mph, the Fusion (on all-season tires) needed only 116 feet, which is very good for the class.. Great Gas Mileage: 29 MPG Hwy.